The pin oak trees planted in April along Park Plaza Drive were still a topic of discussion. Mayor Tim Kent told the Beautification Committee members he believed the Park Plaza trees would be on the agenda for the August 7 meeting of the New Albany Board of Aldermen. 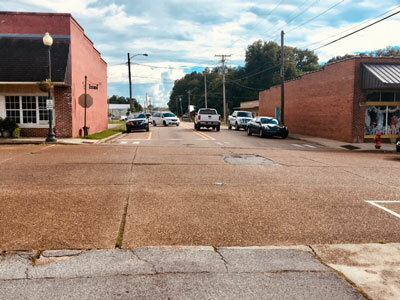 The aldermen had approved planting pin oak trees along Bankhead Street west of the Tallahatchie River bridge. However, when the 150 trees arrived in April, both the Mississippi Department of Transportation (MDOT) and the city-owned New Albany Lights, Gas and Water (NALGW) objected to their being planted along Bankhead. MDOT didn’t want them planted on the right-of-way of Bankhead, which is also State Highway 178. NALGW objected because it did not want the trees interfering with it electric power lines. 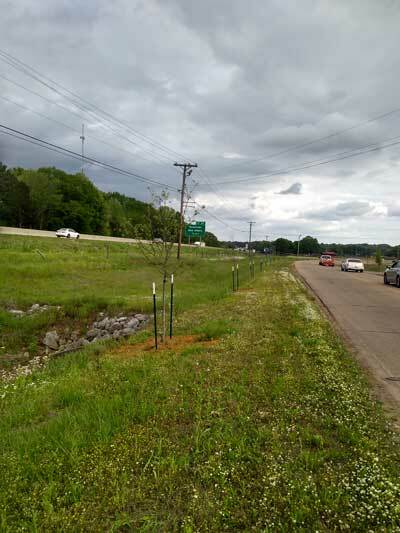 The Beautification Committee then decided to plant the pin oaks along Park Plaza Drive, a busy commercial street that runs parallel to Interstate 22 (I-22). Trees planted along Park Plaza could present problems for widening the busy road in the future. However, at the May 1 meeting of the Board of Aldermen, four of the five aldermen said they had not been informed and did not know about the oaks being planted along Park Plaza until many of them were already in the ground. Pin oaks, a species of red oak, mature to a height of more than 70 feet, a trunk diameter up to three feet and a canopy (spread) of 40 feet or more. The trees are planted 10 – 12 feet from the edge of pavement. There were several objections to the trees being planted on Park Plaza. 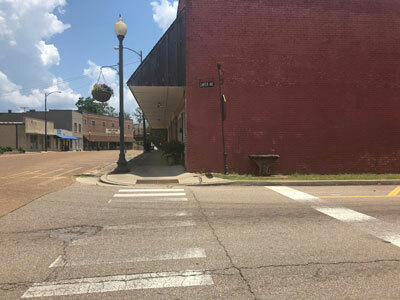 It was said they would eventually interfere with the vision of motorists trying to enter Park Plaza from businesses located on the street, and that they would prevent I-22 motorists from seeing businesses that located there specifically because they would be visible from the Interstate. Some pointed out that, because of heavy traffic, the street already needs to be widened to at least three lanes. It was suggested that some or all of the trees might be transplanted to other locations when cooler weather arrives. Presumably these are some of the issues that will be considered at the August 7 meeting of the city board. In 1976, the National Arbor Day Foundation started its “Tree City” certification program. To date, about 3,400 communities around the country have received the Tree City designation, and New Albany was once one of them. However, the city’s certification was allowed to expire in 2009. To be certified Tree Cities by the Arbor Day Foundation, communities must meet four criteria: (1) Maintaining a tree board or department. (2) Have a community tree ordinance. (3) Spend at least two dollars ($2) per capita per year on urban forestry. (4) Have an official observance of Arbor Day every year. The committee approved applying for re-certification as a Tree City. Sam Creekmore IV, the At-Large member of the Beautification Committee, presented a proposal to put a tree garden and “compass rose” at the intersection of Main Street and Carter Avenue in downtown New Albany. Carter Avenue is the designated downtown exit from I-22. Carter Street site proposed for new Tree Garden. Proposed site of compass rose, intersection of Main St. and Carter Ave.
An arch was constructed last year at the trailhead of the Tanglefoot Trail, a hiking and cycling trail that starts at Bankhead Street in downtown New Albany. Creekmore said he had received a $34.000 estimate from Knight Sign Industries of Tuscaloosa, Alabama, for an identifying sign to be placed atop the arch. Discussion by the committee reflected the view that that was too much, and Creekmore said he would ask the Alabama sign company to do some “value engineering” on the sign proposal. The committee approved installing the city’s new stylized street signs on some streets in Ward Two. Besides Creekmore, committee members present for the Monday morning meeting were: Jeff Olson, the First Ward representative; Jolyne Cooke, representing Ward Three, and Sandy Shaddinger, representative for Ward Two. Mayor Kent and Billye Jean Stroud, Main Street Manager, were also present. 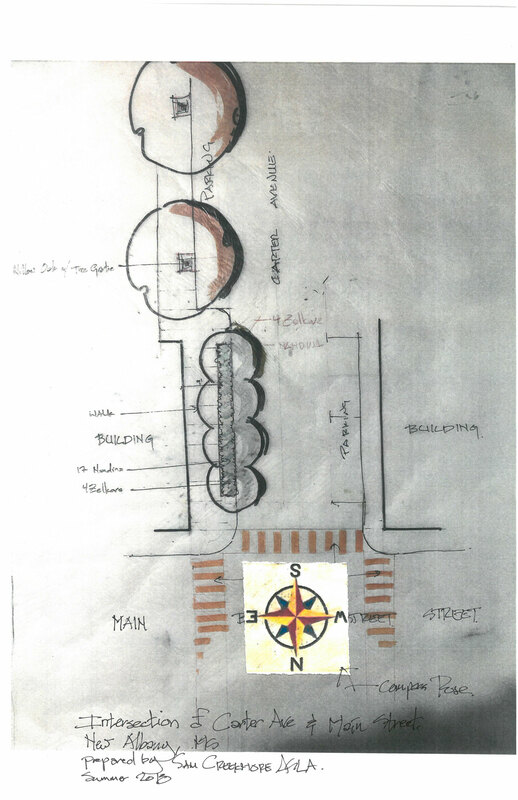 Drawing of proposed compass rose and tree garden installation at Carter Ave. and Main St.
Faulkner's "As I Lay Dying" is jumping-off place for study of Southern death customs during Faulkner month in New Albany.